Disposable. Very good reproducibility of the number of drops per millilitre. Ideal for aliquots. 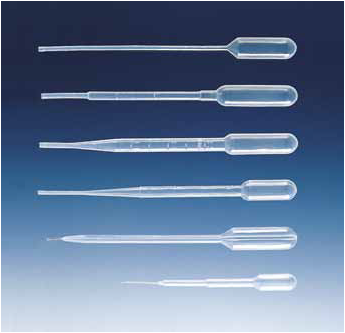 Pasteur pipettes can be filled and deep-frozen, or changed into a closed vessel by heat-sealing the tip. The integrated pipetting bulb depresses easily, minimizing fatigue from frequent pipetting. Resistant to gas or gamma radiation sterilization.